College Degree Trends in the U.S. According to the U.S. Department of Education’s recent NCES report on education statistics, there are a significant number of important trends with respect to higher education degrees. First we will define postsecondary education to get a working baseline of the institutions we are talking about. Postsecondary education includes academic institutions, career schools, technical schools, and continuing professional education programs after high school. American universities and colleges, along with career colleges and technical colleges, offer a vast array of postsecondary opportunities. Regardless of the college or university, the following dataset represents trends in college degrees you need to know about. As such, we have compiled the most important information into a compact report for ease of use. Americans are completing more years of education than ever before. For example, the percentage of 25- to 29-year-olds who had completed high school rose from 86% in 2005 to 91% in 2015; likewise, this same group who earned a bachelor’s degree swelled from 29% to 35% during this same timeframe. Additionally, from 200-2010, enrollment in 4-year and 2-year colleges rose an astounding 37% to 21 million from 15 million. Here is a quick hit of growth in college degrees conferred for the most recent reporting period (2004-2014) the U.S. Department of Education. For more information about data on college degrees, visit our portal to find the Most Popular College Degrees in the United States. 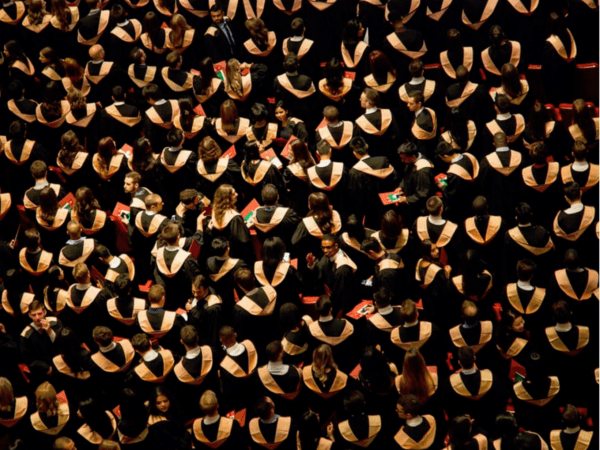 A list of the 200 most popular college degrees will help students grapple with majors, schools, careers, and educational opportunities that existing in each domain. Below is a brief list of high growth degree programs in the U.S. from 2009-2014 culled from the NCES latest report. 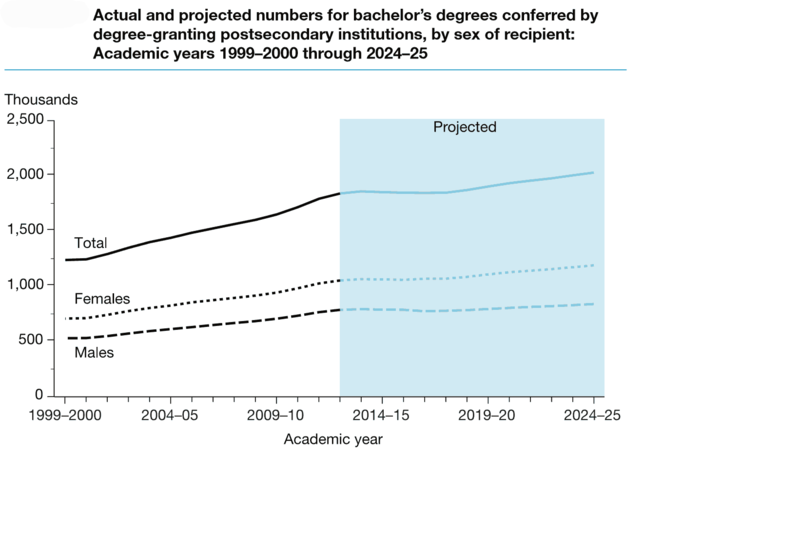 Actual and projected growth of associate degrees conferred in the U.S. Female: an 82% spike from 2000-2013 with a future growth trend of 17% through 2024. 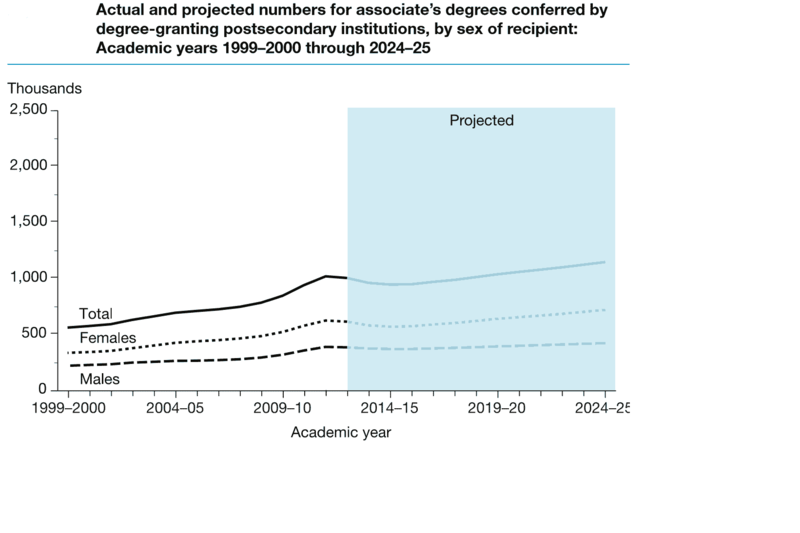 Actual and projected growth in associate degree programs in the United States from 2000 to 2024. Actual growth of bachelor’s degrees conferred in the U.S.
Total: actual growth of 49% from 2000-2013. Male: a 48% increase from 2000 to 2013. Female: an 49% spike from 2000-2013. Actual and projected growth in bachelor degree programs in the United States from 2000 to 2024. Actual and projected growth of master’s degrees conferred in the U.S. Female: an 69% spike from 2000-2013 with a future growth trend of 34% through 2024. 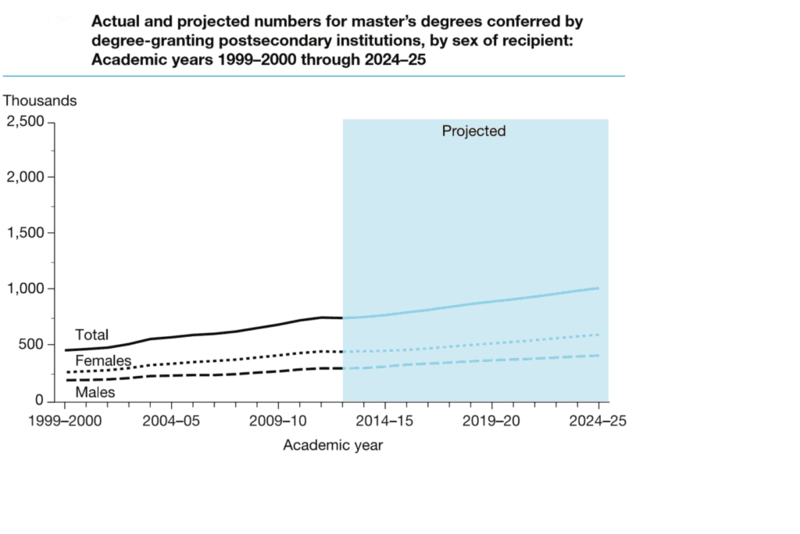 Actual and projected growth in master degree programs in the United States from 2000 to 2024. 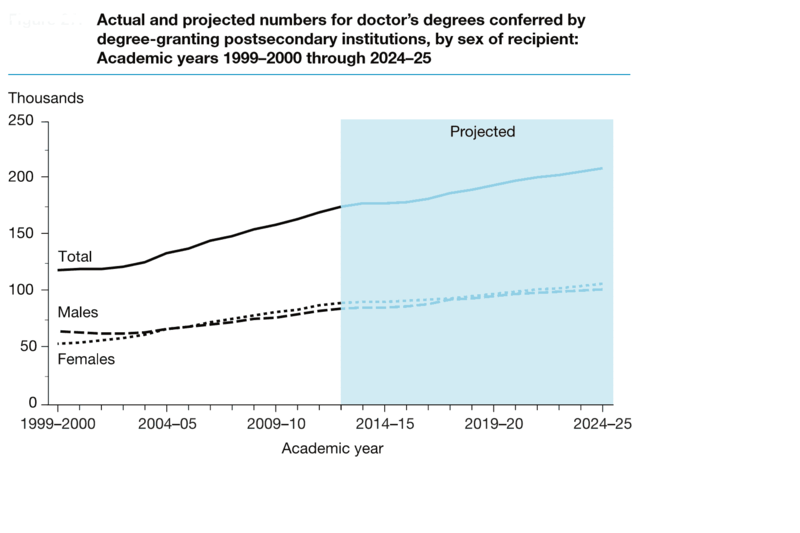 Actual and projected growth of doctor’s degrees conferred in the U.S. Female: an 67% spike from 2000-2013 with a future growth trend of 18% through 2024. Actual and projected growth in doctor degree programs in the United States from 2000 to 2024.